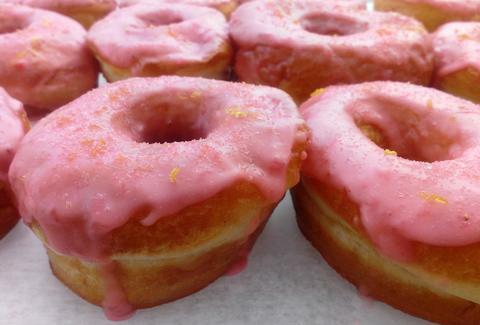 Since coming onto the scene in 2013, Brewnuts has gained significant notoriety for its creative beer-flavored donut creations, such as the strawberry shandy (pictured), topped with fresh strawberry glaze infused with organic strawberry ale. Currently, these boozy treats can be found at local spots such as Rising Star Coffee and Platform Beer Co. Come late winter, Brewnuts’ owners will open a donut-themed bar in the Detroit Shoreway neighborhood, giving patrons the opportunity to hold a beer in one hand and donut in the other. Could anything be greater than that? Alright, so you probably don’t think light when you think of potatoes. However, made from potato flour, Spundnuts’ light, fluffy donuts sport a uniquely delicate flavor that’s completely craveable. While the primary ingredient may not be exactly traditional, the shop’s flavors are classic donut shop favorites, including glazed, sprinkled, and jelly-filled creations. The store’s location is not exactly the hottest spot in Cleveland, so the fact that it still draws a hefty crowd every morning is a true testament to how damn delicious Jack Frost's donuts really are. Playfully decorated, it pops out one-of-a-kind flavors, such as the chocolate iced cassata (pictured). 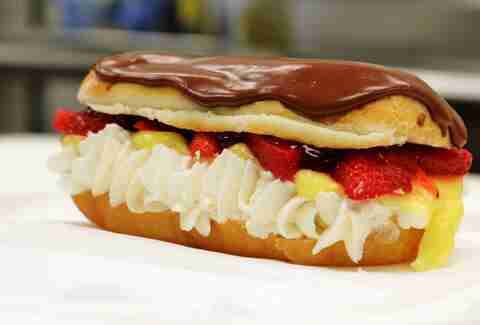 These over the top creations are rich enough to satisfy even the strongest of donut cravings. This family-run business has been in operation since 1946, proving that the best recipes can enable a donut shop to withstand the test of time amidst decades of competition. 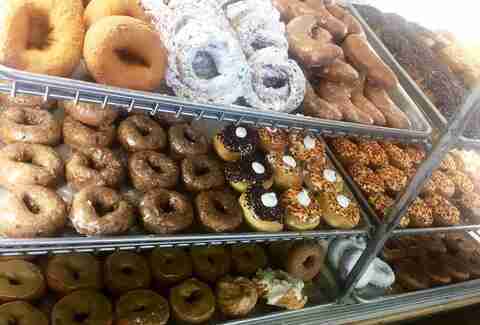 Becker’s offers all of your usual donut standbys, including numerous yeast and cake varieties. Just please do yourself a favor and order one of the bakery’s melt-in-your mouth sour cream donuts, arguably the best of its kind anywhere in town. As the old saying goes, “The early bird gets the worm.” In this case, let’s replace 'worm' with 'donut.' Opening at 4:30am, George’s Donuts have gained such a loyal following, customers simply must arrive early in order to score the goods. Those who do manage to roll out of bed in time are handsomely rewarded with fresh, made-from-scratch donuts that have kept this place hopping for decades. 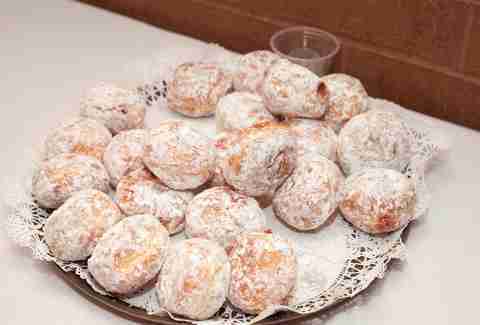 "Donuts are my life," the shop’s owner, Bill Rienerth Sr, has been quoted as saying. We second that emotion. 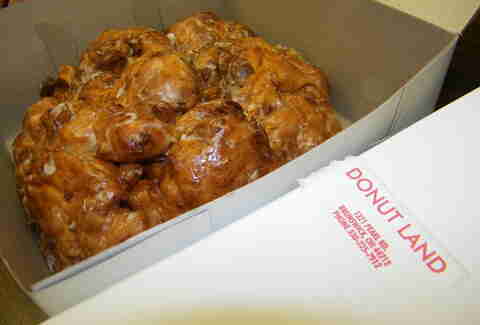 From traditional glazed to donut cakes, and regular-sized confections to absolutely enormous apple fritters (pictured), Donut Land’s more than 40 varieties have something to please all tastes. Sure, they’ve got pretty decent pizza, too, but it’s Biagio’s superb donuts that make this spot a true destination. The store has a classic donut shop vibe with classic donut flavors to match. Try the maple stick or any one of their light and fluffy cream-filled creations for a sugary sweet taste of everything that’s right with this world. Stepping into this Polish-American bakery sure feels like stepping into the warm embrace of your grandmother’s kitchen. Although you can’t go wrong with a single one of Kiedrowski’s delightfully homespun treats, we highly recommend going with the cult classic Snoogle® -- a super-sweet, cream-filled pastry stick that’s gained such a following, it carries its own trademark. Over the years, Mapleside has evolved from a quaint farm, bakery, and apple house to a full on fall-themed event center. 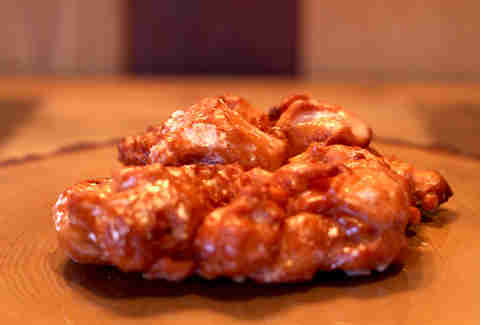 One thing that’s remained constant is the bakery’s delectable apple fritters and cinnamon sugar donuts. Paired with a steamy mug of hot apple cider, these nostalgic treats are nothing short of donut perfection. Beth Phillips is a Cleveland area writer whose ideal Sunday morning includes sampling as many donuts as possible while binge watching reruns of Twin Peaks. You can follow her on Twitter @CraveableCLE.